When 43 trailer tent nutcases from five different countries set off on their skiing holiday in the Austrian Alps with their Camp-lets, they received nationwide TV coverage in Slovenia, network TV coverage in the Netherlands and regional TV coverage in Denmark. Now Camp-let is ready to embark on its next project, i.e. the camping fairs in Copenhagen and Herning. The owners of Alpen Caravan Park in Achensee, Austria, can be in no doubt about the top speed on the campsite’s electric meters after hosting the Camp-let Winter Challenge 2011. Heaters and electric blankets were being used like they were going out of style and all that professional TV equipment does not exactly power itself! The media has a nose for a good story and when trailer tent nutcases from five different countries go on a skiing holiday, sleeping in trailer tents, that’s a good story! You might say the Camp-let Winter Challenge is the modern-day answer to Scott and Amundsen’s polar expeditions. The tents have been replaced by Camp-lets, and the sealskins and bearskins have been replaced by thermal bases in the sleeping cabins, thermal underwear and Jägertee. All 43 of this year’s participants have signed up for next year’s ski challenges, along with Camperlands from Manchester. However, Camp-let A/S Director Hans Jørn Nissen does not plan to open the doors to all and sundry as people need to realise that you have to be tougher than most to camp in a trailer tent in temperatures as low as minus 16°C. “You probably have to be a little crazy to take part. That would perhaps also help to explain why there has been so much media interest in this year’s tour. The Winter Challenge has received coverage in local media and on camping portals, several of which have covered the story in diary form with text and photos on their websites,” explains Hans Jørn Nissen. One of the two national TV channels in Slovenia, Pop TV, had a camera crew down in Austria, and the Dutch camping magazine, KCK, broadcast TV clips to camping fans on a big screen at the Caravana fair in Leeuwarden as well as a number of clips to Youtube.com. Prior to their departure, the Danish regional station TV Syd was also on hand to record a feature on the 20 or so Danes destined for the frozen Alps. “And there have been a number of features on DR regional radio stations and larger local radio stations on Zealand and Lolland-Falster. It is quite funny to see that, what started out as a bet between two men in 2008, has now become a popular event,” says Nissen. His frozen toes defrosted, he is on to the next project: Camp-let’s participation at the two major spring camping fairs in Bella Center and Messecenter Herning. The fair at Bella Center took place last weekend, and this coming weekend it is the turn of Herning. Clips of the winter ski trip will also be shown here, but this is above all to demonstrate that, with a Camp-let, you can come out and be at one with nature whilst maintaining the desire for comfort when it’s time to sleep or prepare food. “Over the autumn and winter, we have experienced major interest both from distributors and customers at the international fairs we have participated at, and I am certain we will find the same thing at the fairs in Copenhagen and Herning. The sale of small cars has risen over the past couple of years. This and the recent price rises on petrol and diesel have led to increased interest in a more environmentally friendly holiday in the form of a trailer weighing less than 500 kilos, with extremely low air resistance,” says Nissen. 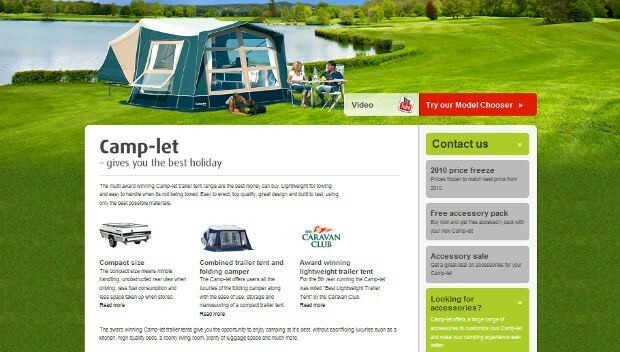 Camp-let have announced the launch of a new website for UK trailer tent customers. As well as giving in depth information on all the Camp-let models you'll find all the accessories to fit your Camp-let trailer tent with an online shop to be added soon. If you are looking for a new Camp-let for 2011 you might want to check out the latest Camp-let offers or use the model chooser to see which is the right Camp-let trailer tent for you. For anyone new to these top quality trailer tents you might want to visit the video centre or read Camp-let info to see why this amazing trailer tent wins so many awards. Camping, the UK’s only magazine dedicated to life under canvas, has awarded Camp-Let’s Concorde winner of the Folding Camper and Trailer Tent Category of their annual awards, in association with Millets. This is the second year running that the Camp-Let Concorde has won this category. Judged by a panel of top camping journalists and readers, the Camping Magazine Awards recognise the hard work and innovation that goes into each product. Judging criteria included: value for money; quality of service materials, build and specification; innovation and originality; excellence of design and styling, safety as well as price. Camperlands are once again taking the award winning Camp-let trailer tents to the NEC in Birmingham for display at the Boat and Caravan show from 22nd to 27th February 2011. This range of lightweight trailer tents will be available to view with demonstrations going on throughout the day so you can see first hand how easy it is to pitch the Camp-let. As well as the Camp-let, you will be able to see all the latest camping and caravan accessories and the new range of 2011 camping tents from all major manufacturers, so why not come and see us in on stand 4070a, hall 4 and get involved. Camperlands are kicking off the new season with the Showtime event running from 1st to 28th February 2011. With the revamped trailer tent display now open, the latest and best models will be available to view and buy with big discounts and package deals available. Tents and awning for both caravans and motorhomes are also on display with upto 50% off during the showtime sale, and there is upto 50% off camping, caravan and motorhome accessories only during the Showtime period. We will also be exhibiting at the NEC Boat and Caravan show from the 22nd to the 27th of February so why not come and see us? 2010 and 2011 model trailer tents now up on display. More 2011 models due in during January and early February. The used trailer tent display area is now open with prices on average 20% less than summer season prices. Our prices easily compete with ebay. There are several differences between buying from ebay and from Camperlands. That's why we are the UKs biggest and best trailer tent retailer and most of all you are buying with confidence. Orders are now being taken for 2011 models and the last of the 2010 stock. Both 2010 and 2011 models are now available with massive savings on orders placed during January and February. 10% deposit to order and collection can be arranged from March to May 2011. 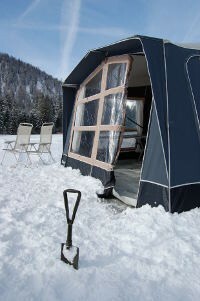 For more details please e-mail our trailer tent department or request a brochure. The video gallery is now back online with the addition of the latest videos from showing how to erect Trigano trailer tents as well as videos on how to fit a range of wheelclamps and hitchlocks. Ideal if you are thinking of purchasing or have just lost your instructions.